Perhaps the future of storytellingâ€“personal, web delivered, mixed mediaâ€“may be hinted in the slick and imaginative AFTERWORLD. Afterworld is a fully immersive sci-fi series. A new kind of computer-animated entertainment that blends video games, graphic novels and anime into one dynamic experience. 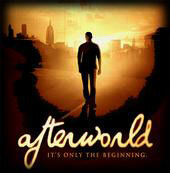 Afterworld is about life on Earth after an inexplicable global event renders technology useless and more than 99.9% of the population missing. The story follows the adventures of Russell Shoemaker, who wakes up in New York after this event and is compelled to walk to Seattle in the faint hope that his wife and child have survived. Russell’s own harrowing journey, from technological dependence to total self-reliance, mirrors the world he discovers along the way, where other survivors are rebuilding society in strange and surprising ways. Piecing together the complex mystery of what caused the global event, Russell eventually paves the way for the bold new future of mankind.